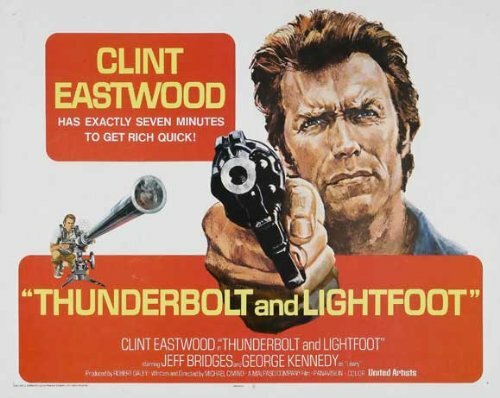 Thunderbolt And Lightfoot could be looked upon as being the archetypal 70’s movie: a crime caper with less than heroic characters, filmed in the mountains of small town Montana and with a typical downbeat ending. It also could be regarded as the screen’s first bromance as there is an underlying love story being played out. John Doherty, nicknamed The Thunderbolt, is in hiding as a priest, when a former member of his gang appears in the middle of a sermon and tries to kill him. Luckily he runs into Lightfoot, a young hotshot and they immediately strike up a friendship. Thunderbolt tells his new friend about a robbery he had been involved with seven years earlier and that the money was hidden in a one-room school. Other fellow members of the gang, Red Leary and the nervous Eddie Goody, are also gunning for Thunderbolt. An idea is created. What if they take the same bank, in the same way, by using an anti-tank gun to break through the vault walls. Will it work and is there, however, honour among thieves? This is the directorial debut from Michael Cimino, who went on to make the classic The Deer Hunter. Having co-wrote Magnum Force, star Clint Eastwood was so impressed with his work that he offered Cimino the chance to helm his own script. The director has openly claimed that if it wasn’t for Eastwood, he wouldn’t have made it as a director. For a first feature, it’s a very assured piece of work. You can see the themes of friendship that runs through this with his later Oscar winner. There’s also the effects of war on those who have fought in them. The Deer Hunter concentrated on the Vietnam War while here, the main character is a hero during the Korean War. The only difference is that in the Robert De Niro starrer, it’s the traumatic effects, while here it’s not having the finance and so having to turn to a life of crime. Cimino has created an interesting crime caper and while it’s very traditional in its execution, it’s more a character study and in particular the growing relationship between the older and wiser Thunderbolt and energetic, enthusiastic Lightfoot. These two men form a bond almost immediately and it develops nicely, even to the point that many have written there could be a love story underneath the criminal activity. Is Lightfoot, in fact, homosexual? He may have picked up Melody but we never see him actually with the girl. We see him staring at a naked woman but very little reaction. He even enjoys dressing as a woman to seduce the telegraph worker, telling himself he’s beautiful. What makes this relationship work is that it is very ambiguous. It’s all done so subtly that you might even miss the nuances and the looks. There is a certain amount of care going on. When Red tells Thunderbolt that he will kill the kid, Thunderbolt instantly sends the threat back. The performances are universally good. Eastwood, as Thunderbolt, has never looked so relaxed. Playing completely against type (again as he often did during the height of his career) as an anti-hero, a medal winning veteran who has turned to crime, really seems to be enjoying himself. 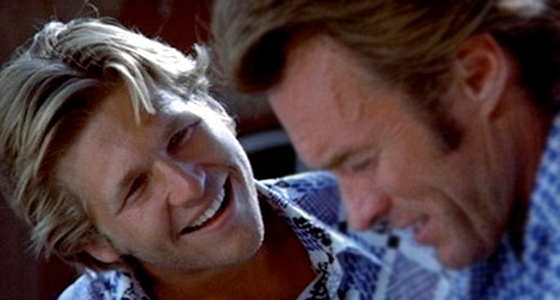 It was said that Cimino had told co-star Jeff Bridges to make Eastwood laugh on and off the set, which he did and it shows on-screen. It’s nice to see Eastwood not as intense. George Kennedy is also on fine form as the violent, angry Red, with a brutal manner but obviously lacking in any female companion, as he almost drools when listening to Lightfoot’s story of the naked woman. Eastwood regular, Geoffrey Lewis is fun as the put-upon Goody, bringing some light relief. It’s Bridges who manages to steal the film from everyone. As Lightfoot, he brings plenty of energy and even when he comes across as annoying, it doesn’t last long. He has so much charm that you cannot help but like him. After some more serious roles before hand, this opened the door for Bridges to show he is more than capable to play lighter roles. He also won his second Oscar nomination for best supporting actor. Thunderbolt And Lightfoot has stood the test of time. It is beautifully shot and well acted and the kind of film that Hollywood refuses to make anymore. So cherish this and see how films really should be made.